19th century French solid silver very good quality serving spoon by Henri Soufflot. 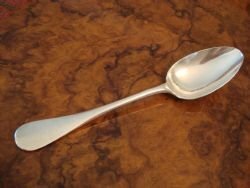 Late 19th century French hallmarked solid silver .950 fine serving or table spoon made by Henri Soufflot of Paris. He was a manufacturer/jeweller who used this rising sun maker's mark from 1884-1910. 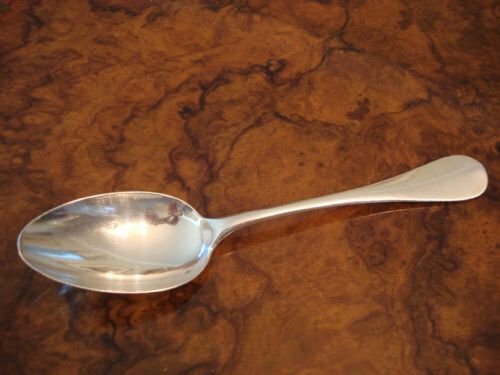 This heavy spoon is first standard French sterling silver at .950 fine, which is a higher silver content than English sterling silver, and bears the appropriate crisp Minerva head mark as well as clear maker's mark in the bowl. Size-8 inches long by 1.75 inches wide. 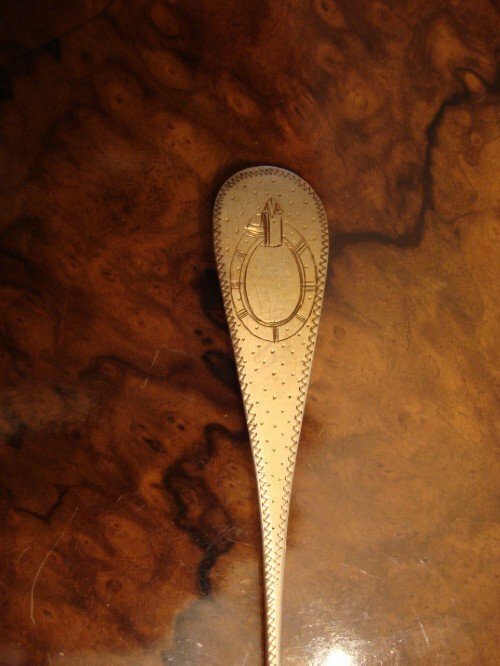 With ornate scrolled initials on the reverse side of the stem, perhaps an M superimposed over an R, this wide stemmed and heavy gauged spoon with simple design is in very good condition. Excellent for serving food, this will blend with any pattern, and would make a lovely yet practical gift to give for a Christening or any special occasion. Circa 1897 rare 1st standard solid silver French complete 87 piece cutlery canteen for 12 people in two original fitted oak boxes, made in Paris by Charles Murat. 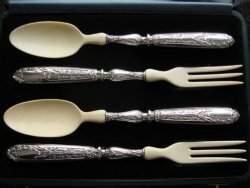 Wonderful circa 1897, with post 1838 marks, French hallmarked solid silver 1st standard .950 fineness 87 piece complete canteen of thick gauged cutlery for 12 people, presented in two original solid oak fitted boxes. The canteen comprises 12 individual 7 piece place settings (see 2nd photo for example of one individual setting), plus 3 serving pieces (3rd photo). The silver content is higher than .925 standard English sterling silver. Each piece was made and marked by Charles Murat. These were made for Masion Murat S.A., 62 Rue des Archives, Paris France, very good silversmiths and jewellers who exhibited at the US Centennial Exhibition in 1876. The lovely pattern is one of a double struck scrolling ornamental grass design with shell accents. There is a tasteful script monogram to the reverse of each stem. One fitted case comprises the large European dinner sized pieces including: 12 dinner forks (8.5 inches long), 12 dinner knives with original steel blades (10 inches long), 12 table spoons (8.5 inches long), 1 large serving spoon (10.25 inches long by 2.25 inches wide), and 1 large soup ladle (13 inches long by 3.5 inches wide). The second case comprises dessert, place or lunch sized pieces including: 12 dessert forks (7.5 inches long), 12 dessert/soup spoons (7.5 inches long), 12 dessert knives with original steel blades (8 inches long), 12 fruit knives with solid silver blades (8 inches long), and a master butter/cheese knife (7.5 inches long). All the original pieces are present, and are contained in two original lined and fitted solid oak boxes having one functioning clasp to each box. The cases measure 17 inches wide by 12 inches deep by 2.5 inches high: and 15 inches wide by 15 inches deep by 3 inches high. Weight of the silver is given without including any estimated weight for the 24 silver handled knives having steel blades. The balance of the 63 pieces of silver weighed equal 4185 grams of .950 silver, which converts to 9.23 actual pounds of weight, or 134.6 troy ounces of solid silver! The pieces all are in very good condition, with a nice patina and slight usage marks. The steel bladed knives have the usual slight discoloration to the blades as expected. Can be professionally removed if desired. This antique service is very unusual in the fact that it includes knives, and all with their original blades. Most antique services either have no knives, or have later modern replacements. In addition, this service also includes 12 solid silver bladed knives for fruit, as the acid would have damaged non-silver blades, another sign of excellent quality. 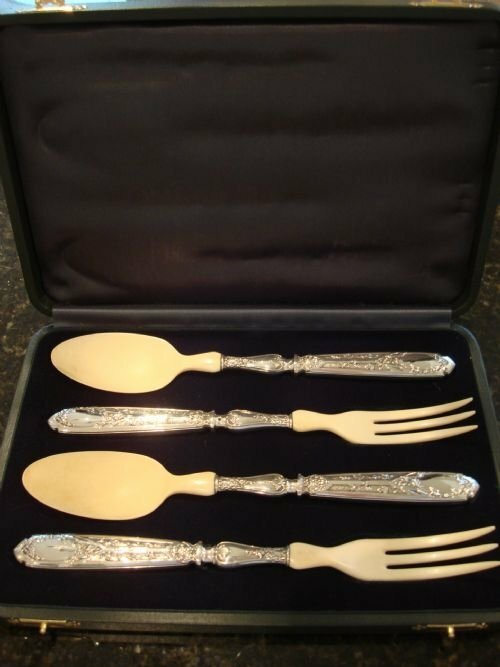 This is a lovely large and complete very good quality set of solid silver cutlery for 12 people, offered in very good condition, and at an excellent value, all original, complete and with cases. Such large and complete services rarely appear on the market. 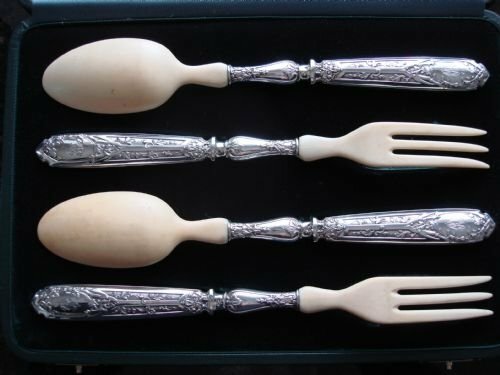 Circa 1885, exquisite set comprising two pairs of French solid silver and ivory salad servers in wonderful fitted case by the great French silversmith EMILE PUIFORCAT. 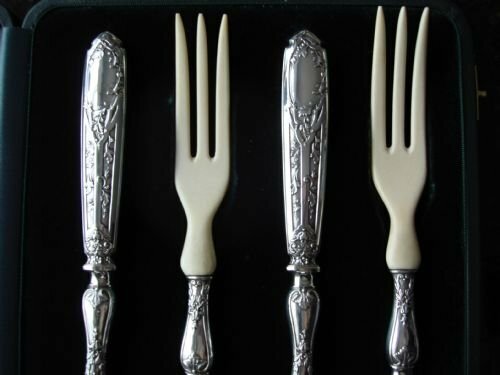 Superb and unusual circa 1885 set comprising two pairs of French solid silver and ivory salad servers by the renowned master French silversmith Emile Puiforcat of Paris. The hallmarks show it was made for export after 1878, in the highest standard of French silver, and with the Mercury head mark. The .950 fine (higher silver content than sterling silver) solid silver handles are beautifully engraved with a stylised leafy tree design. There is a lovely monogram EM to the reverse cartouche, with a blank cartouche to the front. The ivory forming the spoon and fork sections is a pale cream colour, with a lovely grain and patina. Size-each piece is 10 5/8 inches long by 1.75 inches wide at widest point. The case measures overall 12 3/8 inches long by 8 5/8 inches wide by 1.5 inches high. Weight-cutlery only is 320 grams total, and with case 1.2 kilos. These four lovely pieces are fitted into a magnificent later made dark green gilt edged case lined with dark green velvet and satin to the interior. A most functional and extremely beautiful set of 2 pairs of salad servers, by a very gifted maker, and fitted into an exquisite case. I have never seen another set like this. In very good condition and a rare thing. This would be a lovely set to own or to give as a gift for an important occasion, such as a wedding, anniversary, or a corporate presentation. 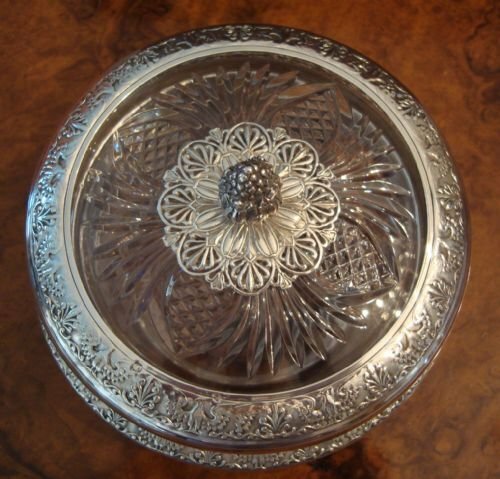 A stunning and very special late 19th early 20th century French solid silver and cut glass covered bowl with eagle design made by Henri Lapeyre of Paris. 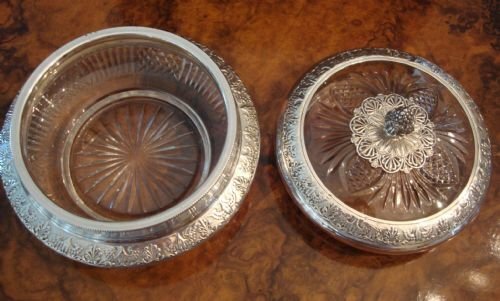 Superb turn of the 19th and 20th centuries French .950 solid silver first standard hallmarked cut glass covered bowl with a very unusual shell, foliate and eagle design. The silver fineness is higher than English hallmarked sterling, which is .925 fine. Beautifully crafted, this very special piece has superbly cut glass in the same design as the silver, with the thick silver mounts on both lid and base encasing much of the glass. The silver maker is the well known Henri Lapeyre of 49 rue Meslay in Paris. His mark (a spoon between two crescents and his initials) was used from 1895-1923. He is known for his fine craftsmanship. He was the successor to Pierre Gavard. 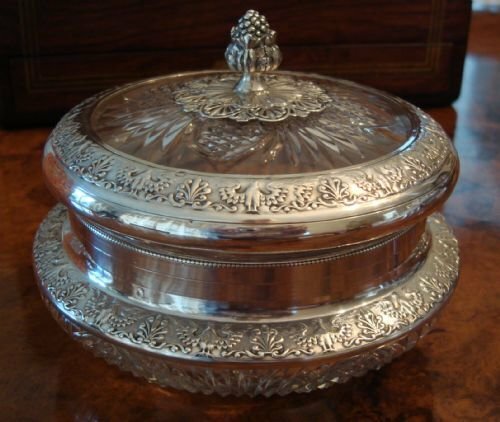 The lid has a repousse silver band around the edge, with the beautiful design of eagles with open spread wings interspersed with shells, and a plain silver band below. The centre of the lid has a lovely pierced silver plaque detail surrounding a cast finial. The base has a thick plain band of silver at the top, and then the bowl widens to include another repousse band of eagles and shells. To show the fine quality of the silver, it is also gilded underneath, and is very generous in the amount of silver used. The profusely cut glass is magnificent and fully complements the design of the silver mounts. Although the glass is unmarked, it is apparent that it had to have been made by one of the famous French glass houses. It was likely originally made as a powder bowl for a dressing table, and can still be used for that purpose. It can also be used to hold sweets or nuts, or as a lovely desk or jewellery tidy. Size-5.75 inches diameter at base or 5.25 inches diameter to lid by 4.75 inches high. 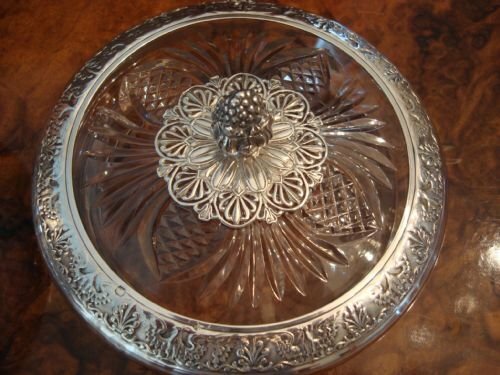 A stunning piece of French silver and cut glass, which would make a great accent for any table or desk, and would also make a very unique and stunning gift. In very good condition, I have yet to come across anything similar in design or craftsmanship. Rare 19th century French solid silver ice cream dessert service in the original fitted case by famed maker Emile Puiforcat, and having interesting provenance. 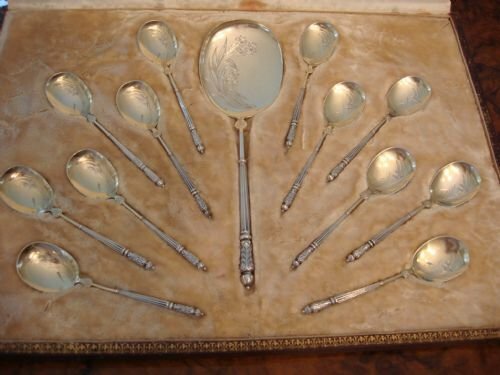 A rare 19th century 13 piece French hallmarked solid silver beautifully engraved ice cream or dessert service for 12 people by renowned master French silversmith Emile Puiforcat of Paris, and fitted into the original large silk and velvet lined case bearing the retailers mark of goldsmith's Paul Reczka of Bordeaux. 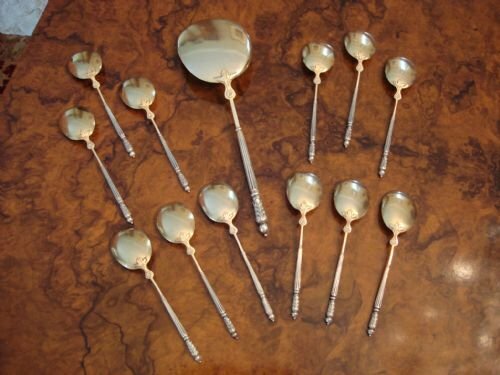 This service consists of 12 dessert spoons, plus 1 large serving spoon with raised edge. They are beautifully engraved within each bowl with pampas grass and flower decoration. The bowls retain their original gilding, have a raised leaf heel, and a flower head design visually uniting both sides to the handle. All pieces are marked with the boar's head mark, used after 1838 for at least .800 fine silver, and also with the maker's mark. 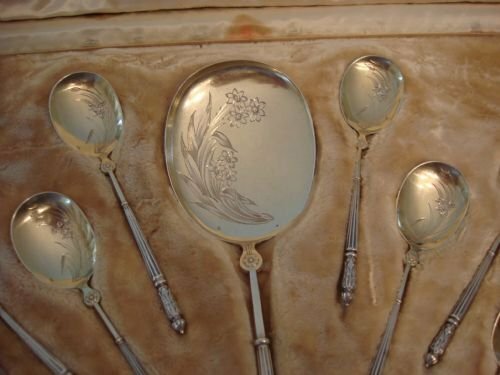 Size-large spoon 9 inches long by 2.75 inches wide; other spoons 5.25 inches long by 1.25 inches wide; overall case size 17.25 inches long by 12.75 inches wide by 2.25 inches high. Weight-255 grams silver, 1.825 kilos with case for shipping. These were from the estate of Sylvaine le Desert. She was the daughter of famous Parisian journalist Jacques le Desert and the granddaughter of the newspaper proprietor and minister, Alexandre Israel. These came from the Paris property of her grandfather, now named Place de Alexandre Israel. Sylvanie survived occupied France by posing as a village girl. She worked the land, and became a member of the French resistance. She lived in Surrey, England for many years, until her death in 2009. This rare service would look wonderful on the dining table when entertaining, and would be very useful to serve and eat any dessert or fruit. It is wonderful to have the full service with the original case retained, made by an excellent maker, and having a very interesting provenance. In very good condition, and a wonderful value. Superb 19th century French silver and enamel snuff box in scallop shell form. French hallmarked solid silver snuff box made for export from 1840-1879, in a lovely scallop shape with all over engraving, bright cutting, and stunning enamel accents to the top lid. The top centre plaque is decorated with musical trophies and accented around with a striking design of cobalt blue, emerald green, white and turquoise enamel with leaf and berry designs among others. The sides are engraved with alternating engraved designs, and unusually, the base is also all over engraved, having a scrolled centre cartouche. 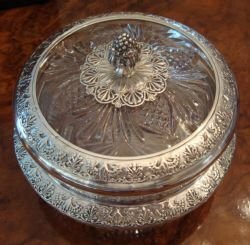 It is decorated so beautifully, that it could be a top lid decoration as well, something only seen in very high quality silver. 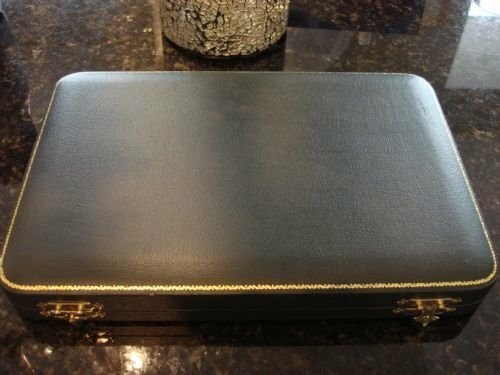 The interior is gilded, and the hinged lid closes securely and is airtight. Marked very crisply with the Mercury head in shaped shield, showing that the silver was made for export during the period stated only. Size-2.75 inches long by 1 5/8 inches wide by 7/8 inches high. Makers mark in lozenge is not identified. A very high quality snuffbox, in a gorgeous shape with beautiful enamel detail, in very good condition. 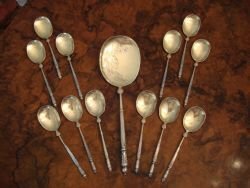 Circa 1840 beautiful set of 12 French solid silver gilt teaspoons and matching tea caddy spoon, made by renowned maker Pierre Queille of Paris, and having a very interesting provenance. 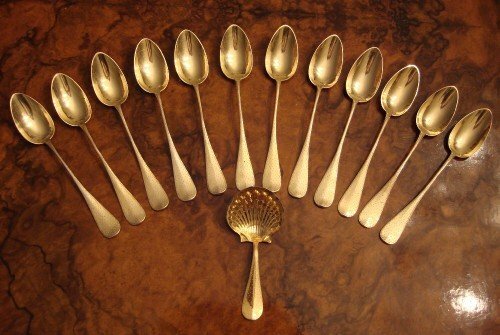 Wonderful and unusual circa 1840 13 piece set comprising 12 French solid silver gilt bright cut engraved teaspoons plus 1 matching caddy spoon. These were from the estate of Sylvaine le Desert. She was the daughter of famous Parisian journalist Jacques le Desert and the granddaughter of the newspaper proprietor and minister, Alexandre Israel. These came from the Paris property of her grandfather, now named Place de Alexandre Israel. 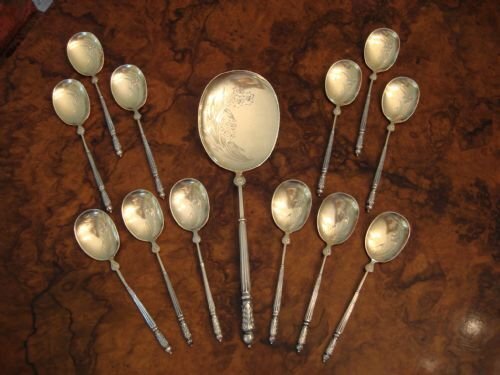 The collection of 13 spoons are marked with the Minerva head for .800 fine, and bear the makers mark of renowned maker Pierre Queille of 70 rue de Faubourg, Montmartre, Paris. He used this mark during the period 1834-1846. He was one of the few silversmiths who made items for the famous House of Odiot, as he was known for his fine craftsmanship. 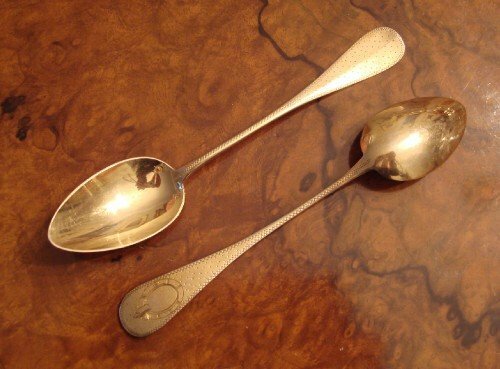 With their original silver gilt, all the spoons have stems engraved with a bright cut double struck pricked dot pattern with a ric rac design to edge. The reverse of each stem bears an interesting family crest. 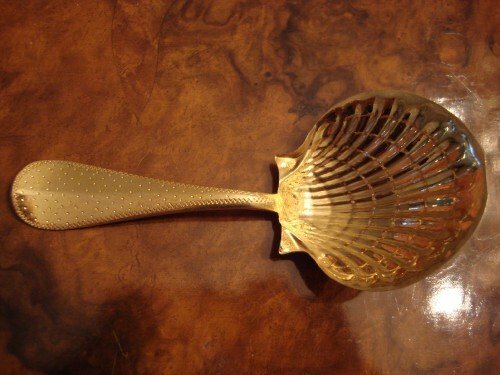 The matching caddy spoon has a beautiful and very realistically modelled scallop shell bowl. This piece alone would be a great addition to a caddy spoon collection. 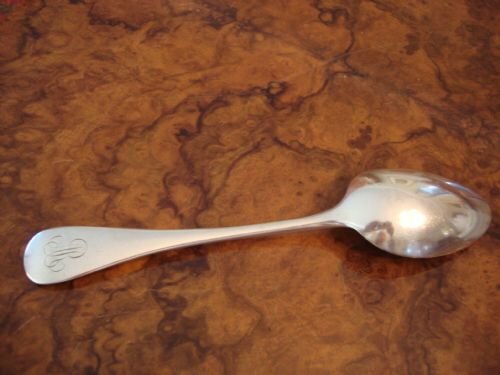 Size-teaspoons are 5 5/8 inches long. Caddy spoon is 4 inches long by 1.75 inches wide. 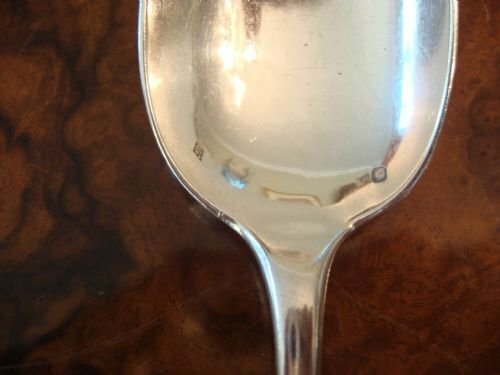 Some of the teaspoon stems are not perfectly straight, from use over the centuries, and there is a flattened spot on the edge of the caddy spoon bowl from use. However, this set is in very good condition overall. 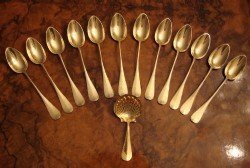 An unusual, beautiful, and complete set of 12 teaspoons with caddy spoon, having a very interesting provenance, and made by a famous maker. These would be wonderful to own to use when serving tea or coffee, to use for small desserts, or to give as a gift. 19thC French 1st standard solid silver wine taster or tastevin. 19th century (circa 1838) lovely French hallmarked 1st standard solid silver wine taster .950 fine, a higher silver content than English hallmarked sterling. A taste vin or wine taster, is designed to catch as much light as possible in order to judge the clarity and colour of wine. Sommeliers and winemakers used the cup with its shiny surface, facets and convex bottom, to be able to see through the wine in dim cellars. This is a fine heavy twist fluted and reverse punched beaded tastevin, without personal engraving, and with thumb rest to ring handle. 3.5 inches in diameter includes handle, or 2.6 inches without handle. 1 inch high, and weighs 50 grams. Wonderful for the collector of small silver objects or the wine connoisseur. A great talking point for a wine tasting party! Hallmarked to all parts, and in very good condition. 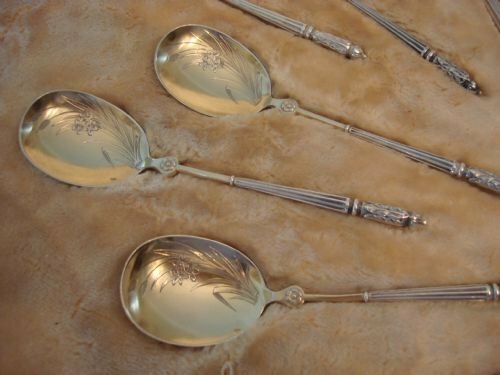 Late 19th century Art Nouveau period 64 piece very high quality French silverplate dinner cutlery canteen for 12 people with knives marked for Christofle of Paris, renowned maker of silver plate and sterling since 1830. Flowing foliate and scroll decoration and excellent quality and weight, and very good condition. 12 dinner forks, 12 table spoons, 11 dinner knives, 10 dessert spoons, 11 place size knives, and 8 place size forks. The place sized pieces augment the dinner size settings for additional people. Sizes-dinner knife 10 inches long, place size knife 8.5 inches, dinner forks 8.5 inches, place size forks 7.5 inches, table spoon 8.75 inches, dessert spoon 7.5 inches long. In very good condition (1 place size knife with blunted tip) this is a lovely large service which will look great on the table at a fraction of the price of sterling. 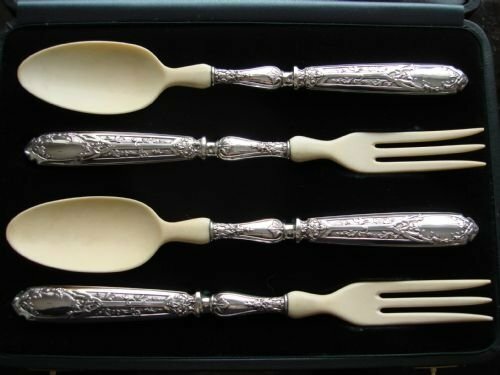 From the same home as the solid silver French cutlery service for 12 listed, and also coordinates well with that pattern, making an expanded service for 24 people if desired. 19th century pierced and embossed handmade silver oval bowl made in France in the first standard of solid silver (.950 fine), then exported to England and assayed in Chester. Therefore it bears both the full import English hallmarks for Chester 1898 for solid silver, as well as the first standard solid silver French marks (higher than English sterling standard). Size 7.5 inches long by 4 inches wide by 3 inches high. An unusual and beautifully made bowl with pierced and embossed top edge, two graceful handles, and cast and applied paw feet.